MAGNIFICENT REPRODUCTION OIL ON CANVAS OF BERNARD BUFFETS'S FAMOUS PAINTING "Tête de Clown". 1955 BERNARD BUFFET REPRODUCTION BY THE FABULOUS ARTIST DAVID ALDUS. 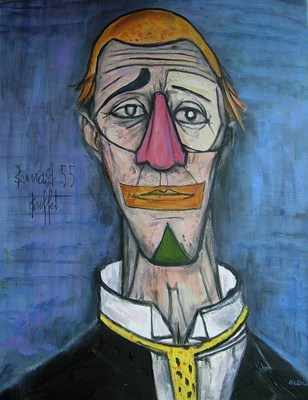 This Lovely reproduction painting of the French expressionist painter Bernard Buffet. David Aldus in completing this reproduction, following the original brushstrokes, felt the sadness and turmoil of the original Artist . ( Highest price received for one of his paintings is £10,000 !!! Absolute investment opportunity! ) Measurements height 20 inches by 16 inches Oil on canvas. .